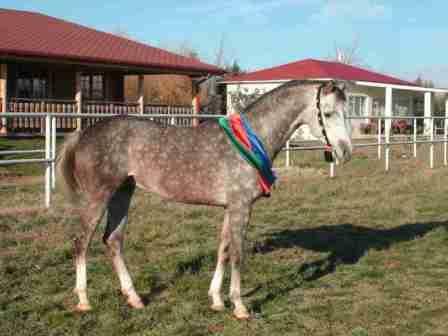 AKPER, Grey stallion, *2002 (Piligrim / Anita). Breeder and Owner: Mr Mamed Guseinov. The Azerbaijan Arabian Horses Club awarded their WAHO Trophy for 2005 to the stallion Akper, one of the earliest Azerbaijan-bred Arabians to be resgistered in the first WAHO approved stud book for this new Registering Authority Member. The reason for the choice is that Akper shows both the typical Arabian characteristics and is also proving to be an excellent athlete. He won a demonstration race at Bina Racecourse on August 10, 2005 over a distance of 1000 metres in a time of 1 min. 09 sec. His dam Anita was imported from Russia in 2001, she is by Namat out of Amira and was bred by Tersk Stud. Akper is her first foal born in Azerbaijan, he was imported in utero and is by Piligrim (Gips / Postup).